Neuroprotective strategies to slow the progression of retinal disease and provide months or years of visual function are desperately needed for patients that have been diagnosed with retinal diseases that have no cure. Our lab is focused on slowing or halting the progression of retinal disease using neuroprotective strategies. This approach has the potential to preserve visual function in patients with age-related macular degeneration, diabetic retinopathy, or glaucoma. We are developing non-invasive rehabilitative approaches as well as testing pharmacological approaches which could be started at the earliest signs of dysfunction. Is physical exercise beneficial to the retina and visual system during progression of retinal disease? Exercise provides multiple benefits to muscles, blood vessels and neurons during normal aging and in disease. Our lab has shown that exercise is also beneficial to retinal neurons—preserving visual function in animal models of photoreceptor degeneration (Figure 1) and diabetic retinopathy. Further investigations are ongoing to understand the source of the neuroprotective effect and the clinical relevancy of these effects. We are also studying the generalizability of exercise to benefit a number of retinal diseases. Other rehab strategies in the lab include the neuroprotective effects of electrical stimulation on retinal neurons and the benefits of visual stimulation to enhance visual function. Can systemic delivery of pharmaceuticals provide direct benefit to the retina? Tauroursodeoxycholic acid (TUDCA) is synthetic bile acid that has several mechanisms of action that prevent cell death, including stabilizing the mitochondrial membrane and reducing oxidative stress. These multiple neuroprotective actions benefit several neurodegenerative disease. Our results show that TUDCA preserves photoreceptor function and structure in a light-induced retinal degeneration model and an inherited mutant model. 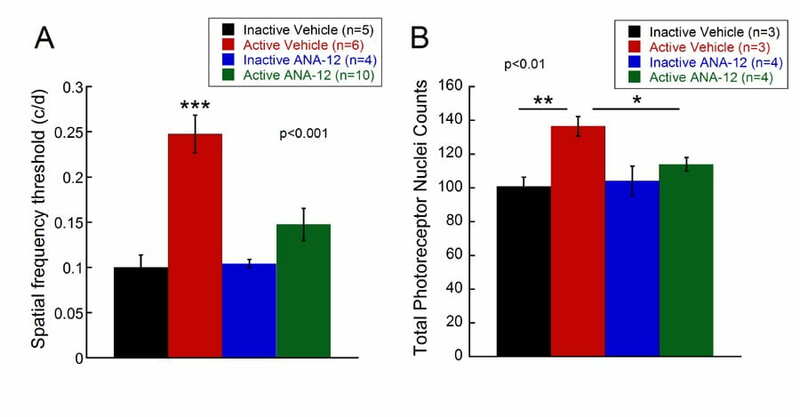 TUDCA injected every three days slowed photoreceptor death after albino mice were exposed to toxic, bright light (Figure 2) and also showed neuroprotection in a mutant mouse model of retinitis pigmentosa, rd10 mice. In a more aggressive inherited mutant model, rd1 mice, daily systemic injections were needed to provide protection. These results, and those of others, suggest that TUDCA is a suitable neuroprotective agent for retinal disease. Further work is needed to determine the optimal treatment windows in retinal disease. L-DOPA, a precursor to dopamine, is an FDA approved drug to treat Parkinson’s disease. Thus, administration of L-DOPA can increase dopamine levels in the body. In the Pardue lab, we use L-DOPA to treat two different visual disorders. In diabetes, dopamine levels decrease throughout the body, including the retina. 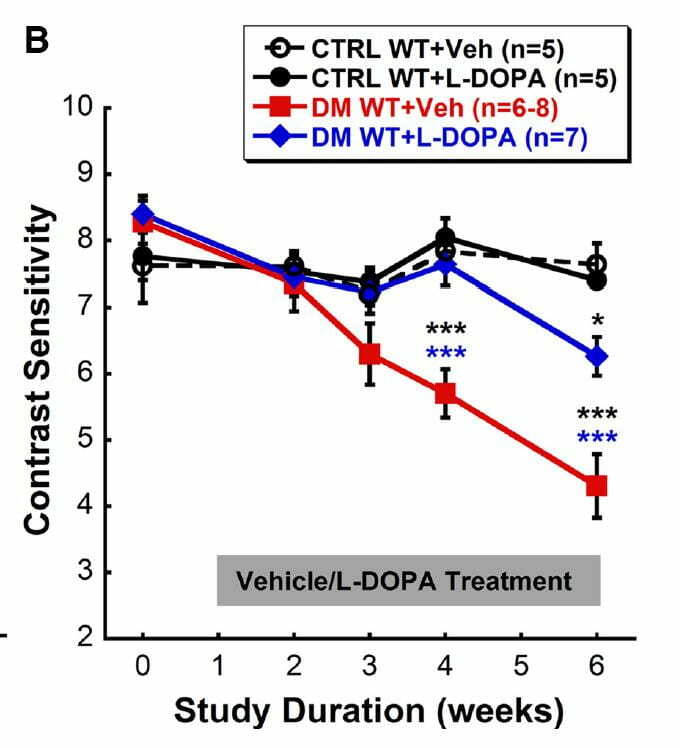 The administration of systemic L-DOPA in early stages of hyperglycemia slowed the appearance and progression of visual and retinal dysfunction in diabetic rats (REF; Figure 3). These results suggest that L-DOPA could provide benefit in diabetic retinopathy, if a suitable screening strategy was in place to detect the earliest signs of retinal dysfunction (See these studies in the lab that are focused on detection of diabetic retinopathy).